Recently, one of my friends (new to SQL Server) was attempting to the deploy the AdventureWorks2012 versions of the sample databases available for download from the CodePlex community on his laptop for study purposes, but was facing an error and hence called me up. 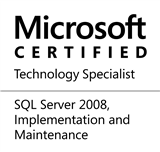 This entry was posted in #SQLServer, Blog, Imported from BeyondRelational and tagged #SQLServer on July 9, 2012 by nakulvachhrajani. But I would like to correct the below mentioned point. This is not true, we can also use this option for Read-only databases as well. I have tested this by making a database read-only and detached it. Then attached using create database For Attach_Rebuild_log option and it was successfully added and database made read/write post that. Thanks for the feedback, Kranthi! I agree that this is a bug with the MSDN documentation. Do keep reading and sharing your feedback! Many Thanks for the details and explanation. I tested with only one file group. You mean to say when database is changed to Read-Only, the Primary Filegroup will also change to Read-Only? Sorry If I am bugging you with my questions.